If you’re reading this, you probably have at least a basic understanding of computers—whoa! Don’t leave! Bear with me for a minute. No, really! That’s how it was done! Prior to the 1980s, complex production was tracked on the manual equivalent of spreadsheets. Seriously. We’re talking about blackboards (yes, real chalk boards—not whiteboards; you never got a buzz from chalk dust, just a nasty cough). Businesses would have huge blackboards mounted on the walls and/or wheeled stands—not one blackboard, mind you, but many. 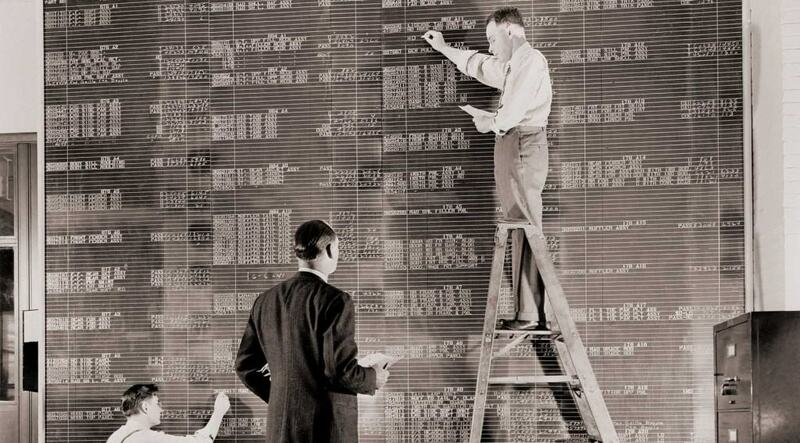 The blackboards were set up with grids, and if a change occurred in one variable, the person tracking it would go from blackboard to blackboard, updating the appropriate sections. Maybe it’s easier with an example. If chairs usually cost $10, but the price changed to $12 and the company had orders for 15 rather than the usual 10, the human Excel operator would go to the place on the blackboard where chair costs were written and change it from $10 to $12. He (the male to female ratio of geeks was even worse back then) would then go to the place where quantity was tracked and change the 10 to 15; it could be the next blackboard or one in a different room. Next, he’d replace $100 (10 chairs at $10 each) with $180 (15 chairs at $12 each). A small mistake (is that 180 or 160? I can’t read my own handwriting) in one part of the blackboard jungle would cascade throughout, and might take days to correct. Today, almost every computer seems to have Microsoft Office, which includes Excel, an extremely powerful program. I’m told that over 80 percent of Excel users are only able to utilize about 5 percent of its capabilities, but still are able to accomplish almost everything they want to do. All that on one screen with no chalk dust. This entry was posted in Business, Education, History, Management, People, Philosophy, Science, Technology and tagged 1-2-3, Excel, industrial engineering, Lotus, spreadsheet. Bookmark the permalink.